"Play on the line of scrimmage, but yet play in the middle of the field, play the centerfield, play a 'Robber' position as we like to call it." - Texas head coach Tom Herman on his team's "Joker" safety position. Being a defensive coach in the Big 12 is one of the most thankless jobs in football. Week after week, opposing offenses bombard their units with Air Raid and Power-Spread derivatives, lining up receivers from sideline to sideline and lighting up scoreboards in the process. It's been nearly a decade and a half since Vince Young raised a crystal football above the crowd inside the Rose Bowl and no other team from the great plains has yet to follow suit and bring a national title to the Big 12. Despite the conference's early adoption of the wide-open offenses that now dominate the game, the league has earned a reputation for treating defense as a mere formality. So, Jon Heacock can't be blamed for having reservations about taking the job leading Iowa State's defense before the 2016 season. In over three decades spent working across nine different stops throughout Ohio, Indiana, and Michigan, the veteran coach was hesitant to move his family all the way to Iowa, only to watch his handiwork get picked apart on a weekly basis. After spending two years working for Matt Campbell for two seasons at Toledo, however, Heacock ultimately decided to follow the hot young coach to ISU. Though they stumbled to a 3-9 record in their first year in Ames, Campbell and Heacock led the Big 12's perennial punching bag to back-to-back eight-win seasons. These efforts included upsets over third-ranked Oklahoma and fourth-ranked TCU in 2017, followed by knocking off sixth-ranked West Virginia last fall and placing the Cyclones directly in the college football spotlight. That 2017 win over Baker Mayfield and the Sooners surprised many, not just because of the perceived disparity in talent between the two sides, but because of how the seasoned Heacock seemed to completely change his schematic identity on a whim. The Heacock name should be familiar to Buckeye fans, as Jon's brother Jim was an Ohio State assistant for 17 years, winning the Frank Broyles National Assistant Coach of the Year award in 2007 as Jim Tressel's esteemed defensive coordinator. Though Jon never joined his brother on-staff in Columbus, opting to stay and take over at Youngstown State when his boss, the same Jim Tressel, left to lead the Scarlet and Gray in 2001, the younger Heacock maintained a similar philosophy to the 4-3 Over system favored by the Ohio State staff at the time. After a disappointing start in 2017 that saw his Iowa State defense give up 44 points in a loss to in-state rival Iowa, Heacock and his staff scrapped the playbook as they knew it, opting to employ a scheme that simply allowed their best 11 players to succeed regardless of position. The result was a new spin on the 3-3-5 Stack defense that proved effective against both the run and the pass. While West Virginia has long employed a version of the 3-3-5 scheme with moderate success and Rocky Long's San Diego State defense has been quietly effective with a variation of their own, Heacock's evolution was unique. While hybrid defenders like Darron Lee had made their presence felt for a while, fast enough to race downfield with receivers but still capable of reacting to the run, these players typically found themselves lined up in the alleys over slot receivers. Over time, offensive coaches have figured out how to scheme these athletes out of a play, using their alignment to one side against them. In Heacock's new system, however, this hybrid player was safety Greg Eisworth, who at 6'0" and 195 lbs had no business mimicking a linebacker and attempting to shed 300 lb blockers. So, instead of putting this key figure on the edge, the Cyclones lined up Eisworth as the third safety right in the middle of the field, roughly eight yards off the line and directly behind the middle linebacker. With only three down linemen on the field, the middle linebacker essentially acted as a run stuffer, filling a gap at the first sign of a run. Despite playing with personnel often reserved for third-and-long, this setup allowed the Cyclones to effectively stop the run for two big reasons. First, instead of simply sending down linemen through the gaps over which they were aligned, the addition of the middle linebacker as the fourth hole-plugger allowed Heacock to slant, twist, and loop his fronts on every snap to mess with the opponent's blocking schemes. Second, Eisworth was tasked with playing the run like a linebacker, tracking ball-carriers from the inside-out and meeting them in the hole. Thanks to his depth in alignment, the middle safety (MS above) was rarely accounted for by opposing blockers, allowing him to run free without an assigned run gap to fill. But although he was lined up at safety depth, this new hybrid defender allowed the Cyclones to still maintain many of the two-deep coverages that Heacock and his staff had initially installed. Eisworth's new role made an immediate impact when Iowa State emerged from their bye week in week five of the 2017 campaign. The heavily favored Texas Longhorns were held to just 17 points and 312 yards in a close loss, followed by the upset over Mayfield and the Sooners. In both contests, opposing quarterbacks were left confused and overwhelmed as their typical reads in the passing game became muddied by this three-deep secondary. 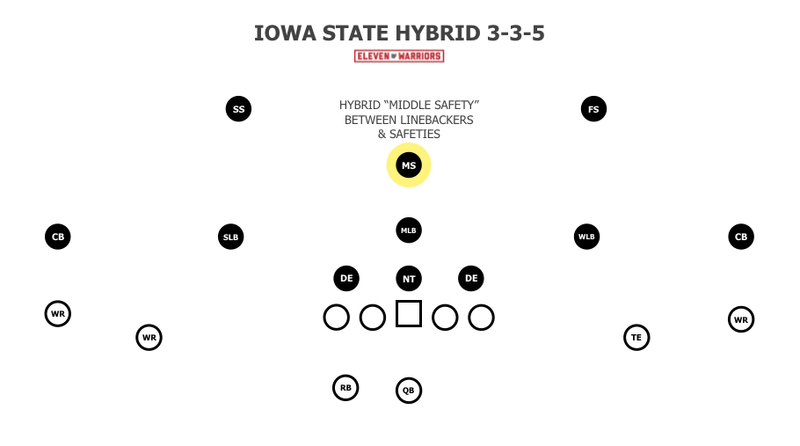 Though the middle safety often played downhill against the run as an extra defender, the Cyclones would often switch things up and send a different member of the secondary on a blitz, rotating the safeties and running a base coverage behind the pressure. The results spoke for themselves. In the following weeks, Texas Tech was held to 336 yards, TCU only mustered 307, Baylor ground out only 331 yards, and Kansas State was stymied to just 264. Poor Kansas only gained 106. Even Memphis, with the nation's fourth-ranked total offense and over a month to prepare, could only tally 339 yards and 20 points in their matchup against ISU. But while Heacock and the Cyclones were making the system work out of necessity, a well-known former Ohio State assistant was intrigued by the possibilities it provided. After seeing Heacock's 3-3-5 firsthand, Texas head coach Tom Herman and defensive coordinator Todd Orlando attempted to incorporate it into their own defense, filling Iowa State's makeshift roles with blue-chip Texas talent. After employing it sparingly throughout the rest of that 2017 season, the Longhorns made it a core piece of their scheme the following fall. Though they had many solid choices for the middle safety spot they named the Joker, given its wildcard potential, Orlando eventually tabbed five-star freshman safety B.J. Foster to fill the role. At 6'2" and 209 lbs, Foster was coveted by virtually every program in the country before deciding to stay home and play for the in-state Longhorns. With size, athleticism, and a nose for the ball, he was a natural at the Joker, tracking down runners from sideline to sideline. Acting as an eraser, Foster's presence allowed Orlando to send pressure on nearly every snap, knowing the instinctive freshman would be there to clean up. Orlando didn't completely borrow Heacock's idea, however, as he adapted the Joker middle safety role to fit his existing 4-2-5 nickel system. When the Lightning package, as Texas calls it, is on the field, it's actually a 3-2-6 personnel grouping with two true inside linebackers at all times. This allows the Longhorns to maintain at least five defenders in the box at all times and freeing the Joker to drop deep in coverage should they desire. But the true versatility of the scheme is due to Foster's unique, hybrid skill set. Instead of taking him off the field when Orlando wants to go back to his base, 4-2-5 look, the talented freshman simply lined up as a stand-up rusher at the end of the line, blitzing like a defensive end and allowing the UT defense to change its philosophy without needing to substitute. Against the high-octane, no-huddle systems seen across the Big 12, this flexibility is invaluable, as the Longhorns are capable of switching from a base, 4-man look to a Dime package on the fly. Thanks in large part to this twist in scheme, both teams remade their reputations as defensive powers in the offense-driven league, joining Gary Patterson's TCU defense as the top three units in the league in both 2017 and 2018. The Cyclones went from allowing 452 yards-per-game in 2016 to 366 in 2017 and 349 last fall. Similarly, the Longhorns went from 448 to 365 before regressing a bit to 392 yards-allowed last season. But although these defenses may still be mocked for their seeming inability to stop explosive offenses, it won't be long before teams outside the Big 12 begin to poach these tactics. With power programs like Clemson, Ohio State, and Alabama all utilizing high-powered spread attacks, defensive coordinators from around the country have already begun studying Heacock's creation in an effort to slow down these powerhouse units, just as they did with Patterson's split-field coverage a decade ago.